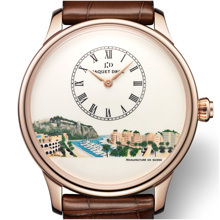 The Jaquet Droz philosophy of time has always been animated by a spirit of exclusiveness permeated with generosity. This year, the Manufacture from La Chaux-de-Fonds will be supporting Only Watch by donating a one-of-a-kind Petite Heure Minute model created especially for the occasion. 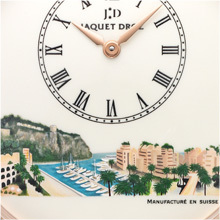 This exclusive piece proudly boasts an ivory Grand Feu enameled dial adorned with details from one of the principality’s most renowned landscapes, a marvelous specimen of the art of miniature painting on enamel. In choosing to apply this painstaking technique, Jaquet Droz wished to honor an ancestral art with a 21st-century interpretation of the traditions practiced by its founder. It takes a master artisan at least a week, with one eye to the microscope, to finish one of these entirely hand-crafted masterpieces. In addition, this Petite Heure Minute features a self-winding mechanical movement, a double barrel, a 68-hour power reserve with a 22-carat white gold oscillating weight bearing a sunray motif executed by the skilled hand of a master engraver, and a Jaquet Droz’ secret signature. 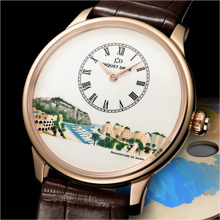 Water-resistant to 3 bar (30 meters), this superlative model comes in a 43 mm watchcase of 18-carat red gold.